Scientists have been using an ancient Greek fable written by Aesop as inspiration to test whether birds and small children understand cause and effect relationships. In "The Crow and the Pitcher," a thirsty crow realises it should drop stones into a pitcher in order to raise the water level high enough so that the bird is able to drink it. A group of US scientists led by Lauren Stanton of the University of Wyoming have now extended this body of work to study raccoon intelligence. Their research in Springer's journal Animal Cognition is the first to use the Aesop's Fable paradigm to assess if mammalian carnivores understand the principles of water displacement. The research team included Sarah Benson-Amram and Emily Davis from the University of Wyoming, as well as Shylo Johnson and Amy Gilbert from the USDA National Wildlife Research Center, where the experiments were performed. The scientists first tested whether eight raccoons (Procyon lotor) held in captivity would spontaneously drop stones into a clear fifty centimetre tube of water to retrieve floating pieces of marshmallow. They found that, similar to studies of birds, the raccoons did not spontaneously drop stones into the tube from the start. Following previous studies on birds and human children, the scientists then trained the raccoons to drop stones into the tube. They did this by balancing stones on a rim on top of the tube. If the raccoons accidently knocked the stones in, this raised the water level high enough to bring the marshmallow reward within reach. Raccoons could then learn that the stones falling into the tube brought the marshmallow closer. During training, seven raccoons interacted with the stones, and four raccoons retrieved the marshmallow reward after accidentally knocking the stones into the water. Two of the four raccoons that got the marshmallow during training then learned on their own to pick up stones off the ground and drop them into the water to get a reward. A third raccoon surprised the scientists by inventing an entirely new method for solving the problem. She found a way to overturn the entire, very heavy, tube and base to get the marshmallow reward. The two raccoons that successfully dropped stones into the tube were then presented with different objects that they could drop into the tube to solve the problem, such as large versus small stones, and sinking versus floating balls. 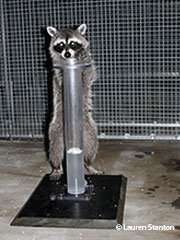 These experiments enabled the researchers to determine whether the raccoons really understood the problem. If the raccoons understand water displacement, they should select the objects that displace the most water, like the large stones and sinking balls. The raccoons performed differently than birds and human children did in previous Aesop's Fable studies, and they did not always pick the most functional option. Stanton, however, believes the raccoons' performance is not necessarily a reflection of their cognitive abilities, but more so of their exploratory behaviour and the build of their dexterous paws. "We found raccoons to be innovative in many aspects of this task, and we observed diverse, investigative behaviours that are unique to raccoons," says Stanton, adding that the way in which the experiment was conducted might also have played a role. She explains that the raccoons had fewer opportunities to interact with the puzzle than did many of the birds that were tested in previous studies. Therefore, the performance of the raccoons might improve if they have more time to familiarize themselves with the stones and the water tube. Despite the low success rates of the raccoons, Benson-Amram is optimistic about running more experiments with raccoons. As Benson-Amram explains "Our study demonstrates that captive raccoons are able to learn to solve novel problems and that they approach classic tests of animal cognition in diverse and exciting ways. We can't wait to see what they do next."